When installing fence corner posts or footings, often 4 x 4 lumber is necessary. Although 4 x 4 lumber comes in different lengths, sometimes it is necessary to cut them down for your project. Most circular saws only cut to a depth of 1 3/4 inches. Cutting a 4 x 4 with a circular saw requires cutting all four sides of the post. When cutting these posts, always use a sharp blade and allow the circular saw to do the work. Do not force the saw through the wood. Measure how much you want to cut off the end of the 4 x 4 with a tape measure. Mark the measurement with a pencil and use a square to draw a straight line at the mark. Turn the 4 x 4 over to the next side and do the same thing. Repeat until all four sides are marked. Place the 4 x 4 on a pair of saw horses with the end you want to cut extending over the side. Clamp the post to the saw horses with carpeneter's clamps or ask a friend to hold the post steady in between the saw horses. Adjust the sole plate of the circular saw to its deepest setting. Loosen the thumbscrew on the back of the plate and push the plate toward the saw until it stops. Tighten the thumbscrew. Plug the circular saw power cord into an outlet or heavy-duty extension cord. Saw on one side of the 4 x 4 at the cut line with the circular saw. Flip the 4 x 4 to the next side once you finish the first cut. Saw at the cut line just as you did on the previous side. Continue this cutting on all four sides of the 4 x 4. Insert a 2-inch wide wood chisel into the center of one of the cuts. Strike the top of the chisel with the hammer until it breaks through the center of the remaining wood. Sand the end with a coarse grit sandpaper if the end you cut needs to be level. Some circular saws cut a little deeper, requiring only cutting through three sides of the post. 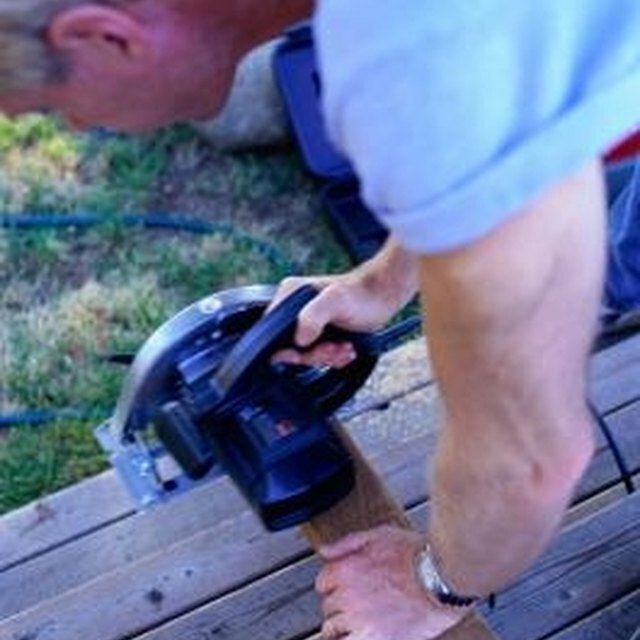 Cordless saws often do not have enough power to cut through 4 x 4 posts.